The Wildcat is home to more than 150 passionate, engaged students, each gaining real-world, on-the-job experience as they hone their skills in journalism, sales, marketing, visual arts and more. Their responsibility: To produce daily, unfettered, editorially-independent news and advertising content. 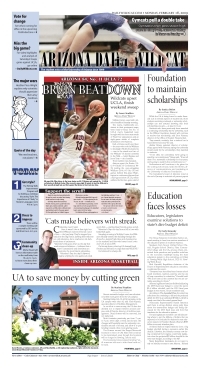 Today’s Daily Wildcat reader expects to receive content 24/7, through multiple channels. This transformation in the delivery of news and advertising means not just keeping up, but staying ahead. Today’s Daily Wildcat staffers need new and better tools and resources that will help them meet this challenge while giving them experience and inspiration for their future careers. You can make it happen. Please join the Wildcat Innovation in Media Campaign. With your investment, we will continue to build skills, develop new revenue streams, recruit and retain talented students, and create an inspiring work environment. Your support will be the foundation for the Wildcat’s future, and will be an enduring link in the Wildcat’s tradition of excellence, both as a news organization and as a launching pad to successful careers.